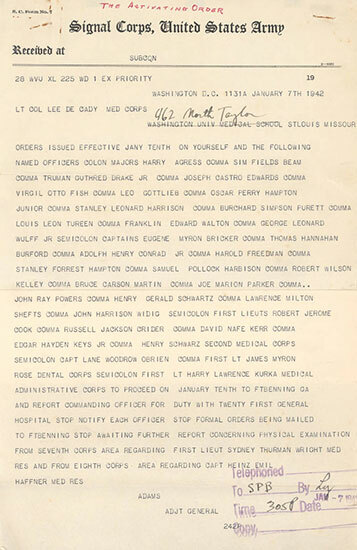 Copy of Activation Order under the form of a “priority message”, dated January 7, 1942, ordering a number of Officers to proceed to Fort Benning, Georgia, and report for duty to the Commanding Officer of the 21st General Hospital (the unit was activated January 12, 1942). 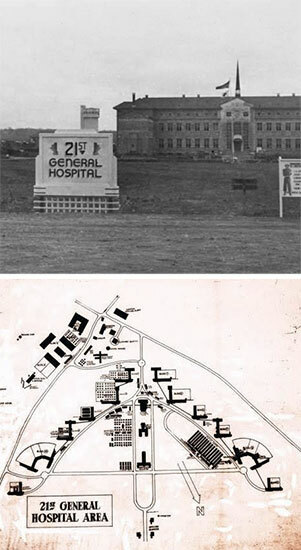 The 21st General Hospital was the successor to the World War I Base Hospital No. 21 which served in France during the Great War. When the British Government requested medical assistance, the United States promised to help. Base Hospital No. 21, staffed by medical personnel drawn from Barnes Hospital and the Washington University School of Medicine, St. Louis, Missouri, was among the first six American hospital units selected for mobilization. The organization consisting of 28 Officers, 65 Nurses, and 185 Enlisted Men under the command of Major J. D. Fife (US Army Medical Corps) left for New York on May 17, 1917 where it boarded a ship with destination the United Kingdom. The Hospital eventually reached Le Havre, France, after transiting via Liverpool, England. Base Hospital No. 21 was finally stationed near the Rouen race tracks, where it took over the operation of No. 12 General Hospital (1300-bed unit –ed), British Expeditionary Forces, as from June 10, 1917. The Hospital treated and handled over 60,000 patients in a period of 18 months, before returning to the United States where it was demobilized in May 1919. 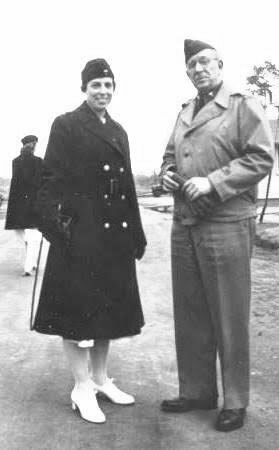 21st General Hospital Chief Nurse Lucille S. Spalding and Commanding Officer Robert E. Thomas at Ft. Benning, Georgia. Photograph was taken in February 1942. Following the Japanese surprise attack against Pearl Harbor December 7, 1941, and the subsequent declaration of war, the War Department drew up mobilization plans and began an important re-organization of the United States Armed Forces. The Surgeon General, Major General James C. Magee, had meanwhile decided to appeal to Reserve Army General Hospitals in order to mobilize so-called affiliated medical units (at the time Lt. Colonel John R. Hall was responsible for handling construction, bed requirements, and planning of hospital units, in close collaboration with the Quartermaster Corps and the Corps of Engineers –ed). Being part of the Reserve Officer Corps, the former Base Hospital No. 21, was called up for service. On December 24, 1941, Lieutenant Colonel Lee D. Cady received confirmation that a new Hospital would be formed. Consequently, on January 10, 1942, accompanied by a number of Medical Officers from St. Louis, he traveled to Fort Benning, Columbus, Georgia (AGF Training Center & Infantry School; total acreage 197,159; troop capacity 3,970 Officers & 94,873 Enlisted Men –ed), where the 21st General Hospital was officially activated January 12, 1942. During the period following Pearl Harbor, the US Army Medical Department had – 22 General Hospitals – 24 Station Hospitals – 17 Evacuation Hospitals – and 8 Surgical Hospitals in service. In addition to already established Training Units, it had been decided to appeal to affiliated Hospital Units chiefly consisting of professional commissioned personnel, such as Doctors and Nurses, which had been gradually organized, but not activated! Under prewar plans, affiliated medical units were to be called to active duty as needed immediately, upon a possible outbreak of war. Major Franklin Edward Walton Major George Leonard Wulff, Jr.
A number of Medical Officers of the 21st General Hospital, while in training at Fort Benning, Georgia, March-September 1942. From L to R: Major Leo Gottlieb, Lieutenant Colonel Lee D. Cady, First Lieutenant Henry P. Lattuada, Major Virgil O. Fish, Major Truman G. Drake, Jr. The General Hospitals were fixed medical facilities in the Communications Zone to which the sick and wounded were sent for definite treatment (medical and surgical). Also comprised in this category were Station Hospitals – Hospital Centers – and Convalescent Camps. While stationed at Fort Benning, Georgia, the unit’s ranks were increased by a number of Officers and Enlisted personnel already in training at the Post. 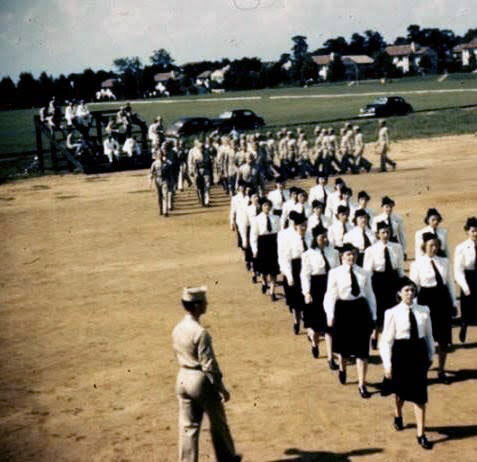 On February 1, 1942, the organization received 55 ANC Officers from Barnes Hospital and the Washington University School of Nursing led by Second Lieutenant Lucille S. Spalding, ANC, who was to become the Chief Nurse. Colonel Robert E. Thomas, MC, a Regular Army Medical Officer, was appointed Commanding Officer February 15, 1942. Formation and review of ANC Officers of the 21st General Hospital, while in training at Fort Benning, Georgia, 1942. Several months of training followed. Training in general was given in compliance with Mobilization Training Program 8-1 (MTP 8-1 published by the War Department February 18, 1942 –ed). Its purpose was to furnish a general guide for the balanced training of Army Medical Department units so that they could be prepared to take to the field in the Zone of Interior or in a particular Theater on short notice. The training program applied to all types of medical units and installations. A standard instruction day consisted of 8 hours with only 4 hours on Saturdays. More time per day could be utilized when desirable, especially in connection with marches, field exercises, and maneuvers. Open times allowed to compensate for interruptions, and to bring individuals or units up to standard – to provide refresher training – or for purposes of mass exercises, such as athletics, games, other exercises, and morale building in general. The training program included the use of technical manuals, training films, and film strips. Basic Training Period: first and second weeks of training, inclusive. This particular aspect stressed preliminary training of the Enlisted Man, who, at the end of subject period, was able to wear properly, display, and care for his uniform and equipment; understand and correctly practice in –and outdoor military courtesy; and have an applicatory knowledge of the essentials of all basic subjects prescribed in the Training Program. Technical Training Period: third to tenth week, inclusive. The training continued, but now placed emphasis upon fundamental technical subjects fitting a particular medical unit or installation. In addition to the technical subjects, specialist training, as well as tactical and logistical training was begun. Tactical Training Period: eleventh to thirteenth week, inclusive. This particular period was largely devoted to field exercises. At the end of this particular period of training, the personnel intended to serve with tactical medical units was able to march and execute tactical movements with facility, establish and operate stations, collect, evacuate, and treat casualties in the field, day or night, operate battalion or regimental aid stations, and participate with the associated arms both in field exercises and under combat conditions. Qualifications for further training in medical specialties, such as dental – laboratory – pharmacy – veterinary – x-ray – medical and/or surgical disciplines, were also available. Enlisted Men could be sent to Medical Department Enlisted Technicians’ Schools for specialist courses (men so qualified were generally selected by the end of the eighth to tenth week of training). 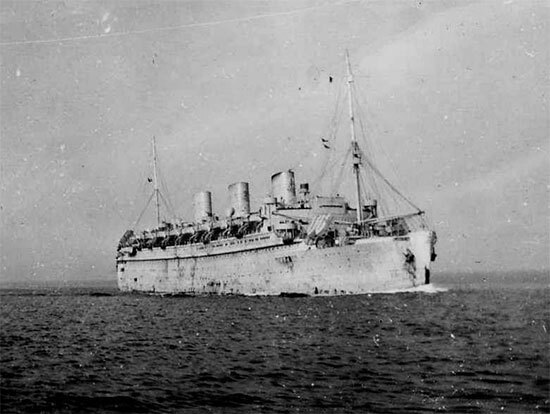 Photograph illustrating the S/S Mariposa, the troopship that carried the 21st General Hospital overseas, from the Zone of Interior to the United Kingdom. She left New York P/E October 20, 1942. At the beginning there was reason to believe that the 21st General would be sent overseas to serve in the South Pacific Area. However, before any movement orders were received, some important changes took place which affected the organization’s preparations for a possible oversea movement. Several cadres of Officers and Enlisted Men were transferred from the 21st to start new training units. One such directive sent 20 Medical Officers to Fort Bragg, Fayetteville, North Carolina (Field Artillery Replacement Training Center; total acreage 129,422; troop capacity 4,311 Officers & 76,175 Enlisted Men –ed), where they eventually formed the 500-bed 21st Station Hospital (this unit, which included several Washington University Physicians, was to serve in Eritrea, where it arrived November 13, 1942, Palestine, Iran, where it started operating May 15, 1943, and Italy, whereto the unit was transferred early March 7, 1945. Its last station would be Naples, where it set up from April 16, 1945 to July 23, 1945. The 21st Station Hospital returned to the ZI September 26, 1945 –ed). An important command change took place before the 21st General Hospital departed from Fort Benning, Georgia. The Hospital’s current CO, Colonel Robert E. Thomas (appointed Commanding Officer from February 15, 1942 to September 21, 1942) was replaced as Commander by Colonel Charles F. Davis (who came from the 7th Station Hospital, which he commanded from May 26, 1941 to September 24, 1942 –ed) September 27, 1942. In the meantime Colonel Lee D. Cady filled in as acting Commanding Officer between September 21 and September 27, 1942. Finally, alert orders were received indicating that the organization would be sent to the European Theater, rather than to the Pacific. The 21st left Fort Benning, Georgia, October 13, 1942, entraining for Camp Kilmer, Stelton, New Jersey, (Staging Area for New York Port of Embarkation; total acreage 1,915; troop capacity 2,074 Officers & 35,386 Enlisted Men –ed). Following the necessary final processing prior to departure, the unit embarked from New York POE aboard the SS Mariposa (ex-Matson liner –ed) October 20, 1942. The ship carried mainly combat troops, but, besides the 21st, there were also five other medical units on board, such as the 26th General Hospital, activated February 1, 1942. The crossing of the Atlantic, though not without danger, proved uneventful. The SS Mariposa reached Liverpool, England, by October 28, 1942. 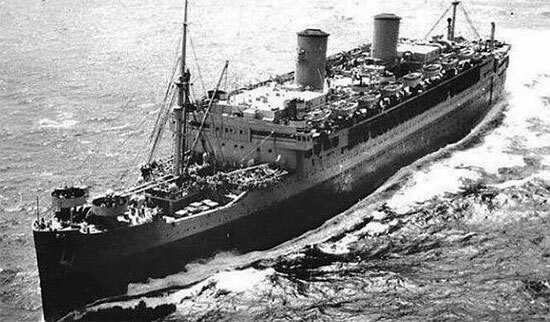 Photograph illustrating the S/S Monarch of Bermuda, the troopship that carried staff and personnel of the 21st General Hospital to North Africa November 27, 1942. 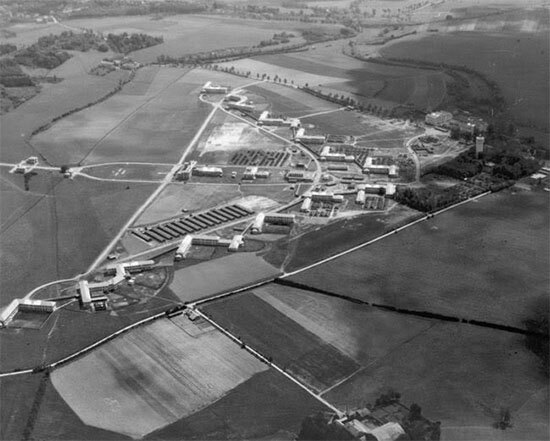 From Liverpool, the 21st General was sent by train and truck to a billet in a suburb of Birmingham, Pheasey Farms Estate. The different unit were assembled and left Liverpool in several echelons October 28-29, for Great Barr, and following detraining, walked to their station, Pheasey Estate, where the command was to be billeted in small two-story brick houses that had been part of an incomplete local housing project. The weather was poor, it was rainy and foggy. Rations were scarce. Perhaps most discouraging was the recent news that supplies intended for the 21st and known to have reached Liverpool harbor had been distributed to other medical units. While the unit was stationed in England, plans were announced that the Hospital would be a part of “Operation Torch,” an Allied offensive to establish control of North Africa which was to take place November 8, 1942. The 21st was transported back to Liverpool. There, with many other units, the personnel boarded the SS Monarch of Bermuda (ex-Furness Bermuda liner –ed). It was more than a little discomforting to find out that she had suffered torpedo damage ten days earlier. Nevertheless, declared to be still seaworthy, the Monarch sailed on November 27, 1942, as part of a follow-up “Operation Torch” convoy. The convoy rounded Ireland and ventured again through waters prowled by German submarines. Safely passing along the coasts of Spain and Portugal, the ships made a brief stop at Gibraltar. From there, they crossed unscathed to Algeria and landed at Mers-el-Kébir, near Oran, on December 6, 1942. Algeria was now occupied by Free French Forces, but the war was not far removed, for the Afrika Korps, under Erwin Rommel, still occupied the larger part of neighboring Tunisia, where American troops were now committed piecemeal in support of the British First Army. Three Officers of the 21st General Hospital at the “infamous” Goat Hill Staging Area (Oran area, the site of Hassi Ben Okba) , where the organization bivouacked, December 8, 1942. 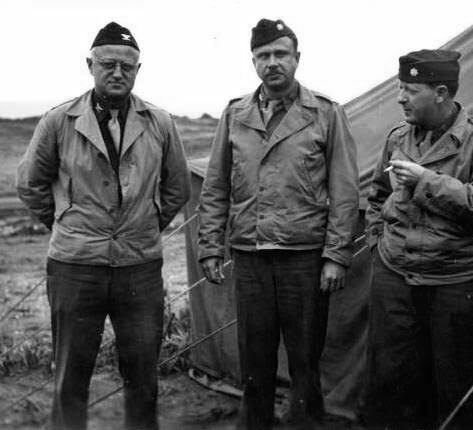 From L to R: Colonel Lee D. Cady, Major Truman G. Drake, Jr., and Major Harry Agress. The 21st bivouacked in the Oran area. An American Evacuation Hospital already on site (this could well be the 77th Evacuation Hospital –ed) assisted the new arrivals. But there were more frustrations in store. The normally sunny Algerian coast was that week pelted by heavy winter rains. The downpour turned the fields where the hospital personnel bivouacked (site at Hassi Ben Okba, designated “Goat Hill”, a staging area situated some 10½ miles from Oran –ed) into acres of mud. Medical supplies were still widely scattered and many lost, ambulances proved to have poor traction when operating in sand, and heavy surf affected further landing of additional equipment. In general, starting December 1942, Allied troops were exhausted and their supplies critically short, and combined with the bad weather, operations simply bogged down in mud. One night, flooding hit the bivouac where the Nurses’ tentage was pitched. They reported seeing clothing and gear swept away in the swift, sudden rush of water. Fortunately, the weather started improving by late December, when the 21st General was transferred to another site in the interior. The Hospital received orders to establish operations at a hot water spa, called Sidi Bou Hanifia, located at an oasis in the rocky desert plateau approximately sixty miles south of Oran. 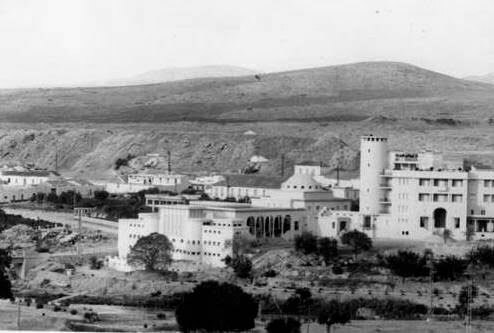 The largest building in Bou Hanifia among the group of resort hotels was the Grand Hotel, which was chosen to house the main medical and surgical functions. Several smaller hotels and buildings in town were also taken over for hospital use. The hot spring water pumped into the baths of these establishments was particularly welcome for use by both patients and command personnel. 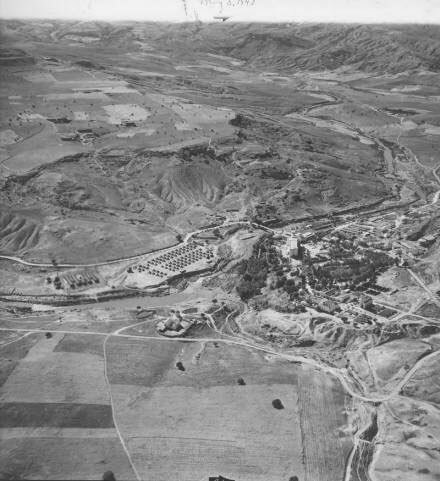 Aerial view of Sidi Bou Hanifia, Algeria, where the 21st General Hospital was established from December 29, 1942 to November 30, 1943. Photo taken May 5, 1943. Inevitably, there was friction at first between the American newcomers, the French civilian population, and the local Arabs. Following a thorough inspection of the new site, the Army Medical Department recommended some urgent actions to raise the level of sanitation at most spa facilities. For weeks, personnel of the 21st supplemented by local labor, scrubbed and scoured buildings and laid down new plumbing and sewage lines. In the process, the Hospital staff learned to be diplomats as well as healers. They gradually won the trust and cooperation of local Arab leaders. It helped immensely, of course, that the 21st General Hospital brought “business” to the war-isolated resort and, thereby, revenue and employment to the residents of the spa center. While operating under control of the Mediterranean Base Section (MBS) which helped set up quite a large concentration of US Army fixed hospitals in the Oran area, Algeria, there were strict instructions to respect dispersal as enemy bombers based on the island of Sardinia and in Tunisia were still well within range of the installations. The hospital build-up in Algeria was essential in order to help set up an important logical hospital base to support the forthcoming invasion of Sicily. A solitary first patient was admitted December 24. Hospital functions only began in earnest starting January 2, 1943, when 472 beds were ready (the number of fixed beds in MBS which was 2,500 on January 1, 1943, quickly more than doubled by the end of the month –ed). Since the supply shortage remained critical, makeshift instruments were used in the first days of surgical operations. Medicines and bandages were administered very sparingly. The problem was gradually alleviated as more and more Allied convoys reached the Mediterranean Base Section. But 21st Officers were at times so impatient as to risk court martial by making unauthorized scrounging expeditions to the depots established in or near Oran. Colonel Charles F. Davis was unexpectedly transferred to another unit in late January 1943 (and subsequently returned to the ZI –ed), with Lt. Colonel Lee D. Cady temporarily assuming command. Weeks went by without a replacement and finally, Dr. Cady was promoted to full Colonel and given permanent command of the 21st General Hospital on January 22, 1943. Colonel Lee D. Cady revealed a considerable talent for public relations, and ran the Bou Hanifia resort with zeal and passion. Hotel kitchens were encouraged to do their utmost to embellish the dull army chow; ranking visitors, even those needing no medical or dental treatments, were welcomed to the spa; the hotel roof gardens were opened up; dances were held and festivals organized. The Hospital staff participated in Arab festivities and respected the local traditions. The numerous efforts to boost morale and to cement good relations with the French authorities and the local population paid off in terms of hospital efficiency. Bed capacity steadily increased. When all appropriate spaces in the hotels were full because of the raise in patient census, temporary buildings and additional tents were erected to house additional wards. 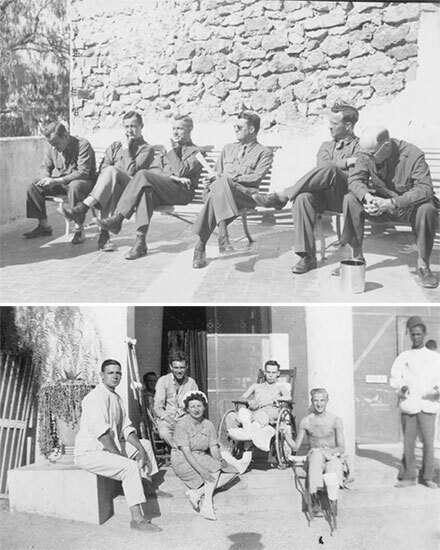 Early in 1943, the 21st General Hospital at Sidi Bou Hanifia, Algeria, inaugurated a Reconditioning Program for its convalescent patients providing them with physical therapy which was supplemented by light work in and around the hospital. This contributed much to the morale of the patients, and at the same time proved some way of partially supplementing the personnel of the command. While the program in general, worked reasonably well, it posed a serious problem as the patients reached discharge and return to duty. Different aspects of medical activities at the Sidi Bou Hanifia resort, with illustrations taken in June-July 1943. Top left: Second Lieutenant Carolyn Klingle, ANC, tends an unidentified patient at Sidi Bou Hanifia. Top right: Scene depicting the Physiotherapy Room at Sidi Bou Hanifia. Bottom left: Thoracentesis treatment of a patient. From L to R: 2d Lieutenant Mary W. Robinson,Major Dan W. Myers, 1st Lieutenant Margaret W. Beumer. Bottom right: Operating Room in action. From L to R: 1st Lieutenant George E. Roulhac, 1st Lieutenant Kathleen McMurrich, Captain John J. Modlin, and 2d Lieutenant Emma A. Miller. Battles in Tunisia in the spring of 1943 led to capture of thousands of German and Italian troops. 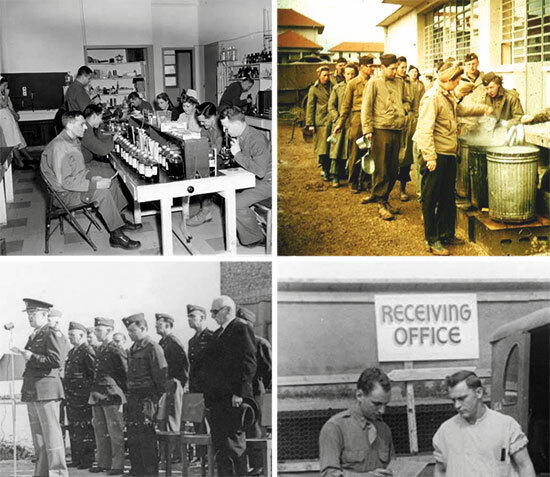 The organization had opened a PW section on April 29, 1943 to care for the sick (many prisoners were suffering from malaria) and wounded in PW Enclosure No. 130, and continued to do so until the end of November. In only 200 days of operation, 2,285 PW patients were admitted, with the largest daily census reaching 538. As quite a large number of prisoners were received for treatment, it became necessary to supplement the Hospital staff with German and Italian medical personnel to assist in their care. Handling of Prisoners of War necessarily increased the complexity of military operations at Bou Hanifia. Among the units called to help were an Army Engineer Regiment, several Military Police Platoons, a Company of Algerian guards, and four Italian PW Companies. Major B. H. Charles was in charge of the enemy PW Section. The PW figure above represented over 13% of the total number of patients treated during the unit’s stay in North Africa. The Prisoners of War were initially housed in pyramidal tents, located within a guarded enclosure. A special PW Guard Company consisting of 1 Officer and 45 Enlisted Men was set up by the 21st General to guard the prisoners. Because of increasing numbers of incoming enemy patients, four Nissen huts, smaller constructions, and small wall tents were added to the enclosure. At its largest while operating at Bou Hanifia, Algeria, the 21st reached a maximum patient census of 4,000 and cared for an average of 1,750 patients (it should be noted that the organization’s T/O called for only 1000 beds). Maintenance and repair of fixed medical installations proved constant problems, with the need for skilled labor such as plumbers and electricians; it was therefore necessary to employ civilian workers wherever possible. Even PWs were borrowed from other enclosures in various capacities to supplement the work force. The 21st staff was pressed to handle casualties from the American and British forces which invaded Sicily in July 1943. The number of patients gradually began to decrease once the Allies conquered all of Sicily and started launching attacks against the Italian mainland. In November 1943, the order came to cease construction at Bou Hanifia and restore facilities of the spa to their prewar functions. In a year of service in the North African campaign, the Hospital treated 20,989 patients. Some of these cases involved important surgical innovations, such as the first decortication of a lung in wartime, performed by Major Thomas H. Burford. The Neurosurgical Service under Major Henry G. Schwartz had developed techniques in emplacement of acrylic skull plates and nerve suture. New methods were also devised in orthopedics and plastic surgery. Major Fiorindo A. Simeone was appointed Assistant to NATOUSA Surgical Consultant Colonel Edward D. Churchill (in view of the Salerno landings September 9, 1943 –ed). Toward the end of operations at Bou Hanifia, a 1000-bed Venereal Disease Section had been established. The Dental Service attached to the 21st had performed 21,299 treatments. (ref. 21st General Hospital in WWII, by Paul G. Anderson, PhD, Bernard Becker Medical Library, Washington University School of Medicine, St. Louis, Missouri). Another view of the main building (the Grand Hotel, hot water spring and spa resort) at Sidi Bou Hanifia, Oran area, Algeria, January-February 1943. As the patient census increased which necessitated additional personnel, the inadequate staff were to be supplemented by surgical teams mostly consisting of 3 Medical Officers, 6 Nurses, and a number of Enlisted Men. As a result the 37th Medical Hospital Ship Platoon (which had arrived in Oran October 1, 1943 –ed) was attached to supplement the command. It remained attached to the 21st until November 21, 1943 (the Platoon would be serving the 21st General once more, moving to Italy January 24, 1944, where it joined the Hospital at the Medical Center, operating in the Naples-Caserta area –ed). Other units such as the 34th and 36th Medical Hospital Ship Platoons also assisted in supplementing some of the hospital units treating PW patients (the units involved were the 16th Evacuation – 26th General – 56th Station – 61st Station – 180th Station Hospitals –ed). After Italy became a co-belligerent, Italian PWs were separated from the German prisoners, and eventually organized in service units of various types. Plans for hospitalization foreseen in both the assault phase and the subsequent stages of the Salerno landings (“Operation Avalanche”) contemplated debarkation of fixed hospitals following the mobile units supporting the assault and combat divisions. It was planned that within 45 days following the initial assault of September 9, 1943, six 500-bed Station Hospitals and four 1000-bed General Hospitals were to land, thus contributing to the build-up of Army Hospitals in Italy. The next phase of the Italian Campaign was to carry the Allies to Naples and to the Volturno River. Following the capture of Naples, the Medical Department opened its first hospital plant in the city on October 9, 1943. A re-organization of Fifth United States Army Forces took place mid November before launching the assault against the fortified positions of the German Winter Line. Subsequent fighting and strong enemy resistance not only caused heavy casualties, but battle fatigue and exposure to the weather elements took a heavy toll, causing a winter stalemate. 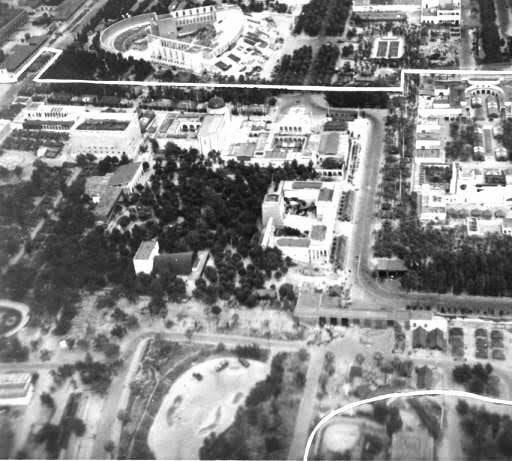 Aerial view of the 21st General Hospital during its stay in the Naples-Caserta area (the Mostra Fairgrounds Medical Center), where the organization was established from December 29, 1943 to September 26, 1944. With hospital equipment packed into more than three thousand wooden crates, the organization left Bou Hanifia for Oran. Alert orders had given Naples, Italy, as the next destination. The ANC Officers sailed December 4, 1943 on USAHS Shamrock (ex-troopship Agwilion, converted into a hospital ship in June 1943 –ed) arriving in Naples December 21. The remainder of the unit boarded the British transport vessel HMT Cameronia (ex-liner, requisitioned for troopship use in December 1940 –ed) December 16, 1943. The ship was overcrowded, carrying 4,000 passengers (traveling on the same ship were the 12th General – 32d Station and the 45th General Hospitals –ed), including Officers, Enlisted Men, WACs and Italian PWs. The Southern Italian coasts were still within range of German bombers and were frequently under their attack. Once again, luck was with the 21st and the Cameronia arrived at Naples unharmed. In July 1943, Allied Force Headquarters (AF) and Headquarters NATOUSA, had moved from Algiers to Caserta, Italy, with the Theater Medical Section set up in the Italian Royal Palace. A survey of Naples with the object of selecting appropriate sites for hospitals, lead to the “Mostra Fairgrounds”, site of Benito Mussolini’s Colonial Exhibition of 1940, which contained a vast number of spacious buildings well-suited for hospital use. After the Allies took control of Naples, the Fairgrounds were set aside for exclusive hospital use by Fifth United States Army authorities. It quickly became the staging site for hospital units arriving in Italy and was designated a Medical Center, to be run by several units, including the 21st General Hospital. Near the Fairgrounds was another tourist attraction, Terme di Agnano, like Bou Hanifia a hot water spa. This became the Officers’ billets. Other fixed hospitals were established in the Caserta area, close behind the Fifth US Army front. 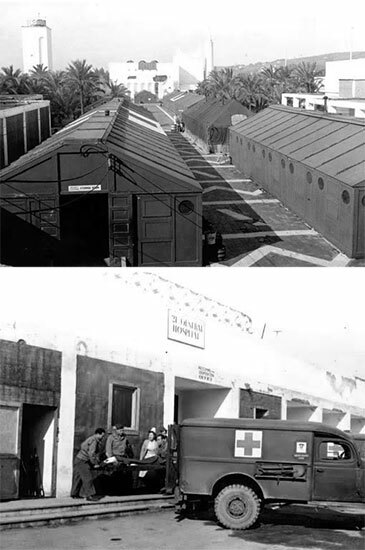 The very first fixed medical installation opening in Italy was the 118th Station Hospital (October 14, 1943 –ed). During November and December 1943, hospital facilities in the Naples-Caserta area built up rapidly. The 225th Station Hospital arrived at the Medical Center November 10; followed by the 23d – 21st – and 45th General Hospitals on November 17, December 29, 1943, and January 1, 1944, respectively. Top: Partial view of the Medical Section (designated Libya Court), 21st General Hospital, Naples, Italy, March 1944. Bottom: View of the Receiving and Disposition Section run by 1st Lieutenant Frances M. Anyon, ANC, 21st General Hospital, Naples, Italy, March 1944. After the relative comforts of Bou Hanifia, Naples inflicted substantial hardships on the unit. Fierce fighting continued only a short distance away. Cold rains drenched the region throughout December and January. Many Fairgrounds buildings had been badly bombed by the Allies and partly-destroyed by the retreating Germans, and eventually strafed and bombed by the enemy after the Allies took over the complex (the last German raid took place October 21 –ed). Tents were used to shelter many of the sick and wounded while urgent repairs were being made. Hospital personnel, CWS specialists, and Amy Engineers joined forces to clean, disinfect, and repair the damaged buildings as quickly as possible. The surgical service was set up in the “Albania” building, its roof patched with plexiglass and gobs of asphalt. A heroic mural of Mussolini, became a target peppered with multiple bullet holes. A recovery ward was established in a chamber where decoration ironically lauded the prowess of the Italian soldier. Tents were erected in a courtyard to shelter the Officers’ mess. Nearby was the “Libya” building, housing Hospital Headquarters. The Fairgrounds had included a small zoo. A barn erected for giraffes was allotted to the Enlisted Men’s club, and the small animal house converted into a bakery. On January 22, 1944, Allied Forces invaded the central Italian coastline at Anzio (“Operation Shingle” –ed). In the weeks that followed, attacks were launched on German positions in the mountains, notably at Cassino. Train and shiploads of casualties from these engagements, as many as 300 at a time, were brought to the 21st, straining staff and bed capacity to the utmost. In addition, the unit was called upon to help stem a typhus epidemic in Naples. The most critical period of service during the Italian campaign came in June, with battles leading to the fall of Rome, liberated June 4, 1944. Top left: Partial view of Dental Section with Captain Stanley S. Goldberg at work. Top right: View of Enlisted Men Patients’ Mess with Head Dietitian, First Lieutenant Kathleen R. Creech overlooking the situation, March 1944. 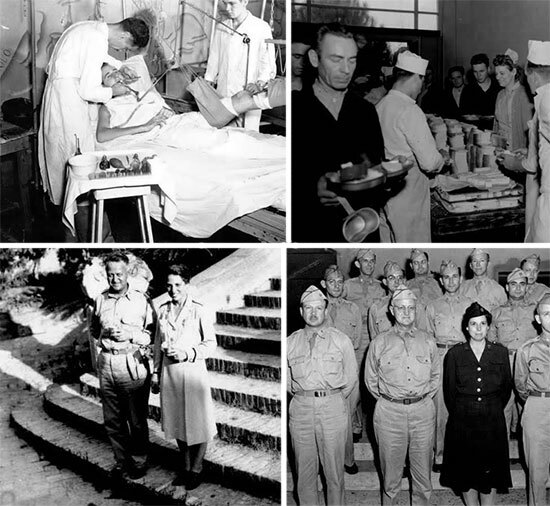 Bottom left: Photograph of Colonel Lee D. Cady and Major Lucille S. Spalding at the Terme di Agnano (spa) during a “family dinner” organized by Lieutenant Colonel Harry Agress, 21st General Hospital, August 1944. Bottom right: Officers of the 21st General Hospital, responsible for the Rehabilitation Program, Naples, Italy. First row, from L to R: Lt. Colonel Truman G. Drake, Jr., Colonel Lee D. Cady, Captain Lucille S. Spalding, Lt. Colonel John F. Patton; second row, from L to R: Major Abe A. Bolotin, Lt. Colonel Sim F. Beam, Major Henry G. Schwartz, Captain Bernard L. Greene; third row, from L to R: Lt. Colonel Lawrence M. Mulhall, Major Joe M. Parker, Major Joseph C. Edwards, Captain Robert E. Peck. By March 1944, the Theater was 8,000 beds short and new troops were still arriving in the Mediterranean. The new Theater Surgeon, Major General Morrison C. Stayer (who had meanwhile replaced Brigadier General Frederick A. Blessé –ed) was struggling to increase the number of fixed beds substantially. The main problem was due to the build-up for Operation “Overlord” which held up any diversion of beds or medical personnel. Some plans already contemplated enlarging certain General Hospitals in the region to 1500 and 2000-bed capacity and on April 19, 1944 Tentative Tables of Organization for such Hospitals were indeed issued. The planned reorganization went into effect June 5, 1944. 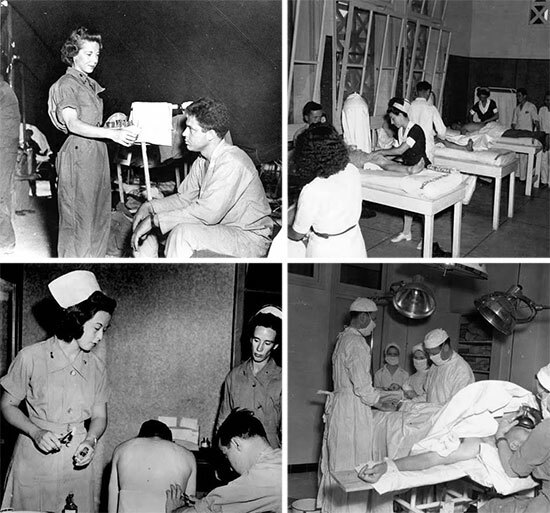 First, a number of Station Hospitals in North Africa were inactivated. Five (5) General Hospitals including the 12th – 21st – 23d – 36th and 300th General Hospitals all established in Italy, were expanded from 1000 to 2000 beds. The remaining other 12 General Hospitals were expanded from 1000 to 1500 beds. Each of the new 2000-bed units absorbed the personnel and equipment of the recently inactivated organizations. As such the 21st General absorbed the inactivated 58th Station Hospital including operation of the Pomigliano Airfield Holding Hospital. Thanks to this reorganization, some 9,500 fixed beds were added to the Theater. Another T/O amendment took place in July, and by then, General Hospitals in Italy had started enlarging their plants by new construction, by conversion of additional building space, or simply by pitching additional tentage. Most General Hospitals had already expanded to 3000 beds each by May 31. The success of the D-Day Invasion of Normandy (June 6, 1944) permitted Allied offensives in Southern France in August. By September, territory as far north as Lorraine had been liberated from German control. Orders were sent for the 21st General Hospital to follow and establish operations on liberated French soil. On September 25, 1944 the unit pulled out of the Naples facility. Just short of 15,000 new patient records had been added to the Hospital’s statistics. The 21st was recognized as one of the finest medical units in the Mediterranean Theater, and not only by American military authorities. For assistance to the Free French forces (French First Army –ed), General Alphonse Juin awarded the 21st General Hospital the French Croix de Guerre (ref. 21st General Hospital in WWII, by Paul G. Anderson, PhD, Bernard Becker Medical Library, Washington University School of Medicine, St. Louis, Missouri). Aerial view of Mirecourt, France (Hôpital Psychiatrique de Ravenel), where the 21st General Hospital was established from October 21, 1944 to September 12, 1945. Early October, the USAHS Ernest Hinds (ex-troopship AP-28 converted into a Hospital Ship June 1944 –ed) carried the Hospital’s Nurses from Naples, Italy, to Marseille, Southern France. Three (3) Medical Officers, 4 Hospital Dietitians, 2 Physio-Therapists, 6 American Red Cross workers, and 12 Enlisted Men from the organization accompanied the 119 ANC Officers on the ship, which arrived in Marseille October 10, 1944. The remainder of the unit, including its organic equipment and vehicles traveled separately aboard 2 Landing Ships Tank and 1 freighter which had left Naples earlier, reaching S. France on October 4, 1944. Following arrival in port, the 21st command maintained the utmost vigilance to keep their precious cargo intact. Colonel Lee D. Cady, assisted by Lt. Colonels Sim F. Beam and John F. Patton, flew north to Seventh United States Army Headquarters in Lorraine, where it was learned that the new site for the 21st General would be a French Psychiatric Hospital in Mirecourt, situated almost 31 miles south of Nancy, in Lorraine. During fall of 1944, a number of fixed Hospitals were transferred from MTO control to the European Theater of Operations. The change occurred November 20, 1944, with the 2000-bed 21st General Hospital now being attached to the Continental Advance Section (CONAD –ed) with Headquarters in Dijon, France, and setting up at a new site in Mirecourt, France. The selected site was an unfinished plant of a large modern French Psychiatric Hospital (designated “Hôpital Psychiatrique de Ravenel”, subsequently used by the French Army from September 1939 to June 1940, taken over by the Wehrmacht and designated “Frontstalag 120”, from July 1942 until September 1944, and eventually in use by Seventh United States Army, starting October 1944 (the Hospital re-opened in April 1947 for civilian use –ed). Red tape delayed efforts to move the Hospital out of Marseille for several days. Finally, orders came through and a Hospital Train for personnel and the necessary freight cars were reserved to carry the unit and its equipment northward. On arrival at Mirecourt railway station, several convoys of trucks met the trains to take the 21st to Ravenel Hospital, where it was to operate Hospital Plant # 4401. The 21st would eventually run the plant jointly with the 238th General Hospital. Top: Administration building and signpost, 21st General Hospital, Mirecourt, France, the organization’s last overseas operation. Bottom: Vintage map illustrating the Hospital’s area. The hospital buildings had been in the final stages of construction when the war began and fortunately had not been damaged during the German occupation. With assistance from American engineers, the medical facility proved well-suited to the needs of the 21st General, boasting spacious wards and central heating. By November 1944, over 3,000 patients were being treated daily. The fighting grew more intense as Allied forces edged closer to the German border. Increasing numbers of casualties were received at Mirecourt, including quite a number of enemy patients to be treated alongside Allied servicemen. Understandably, the staff was somehow concerned about possible outbreaks of violence in the wards, but the situation was alleviated to a degree early in December, when part of the staff of a German Hospital was captured at Strasbourg and sent to Ravenel. Soon, these Doctors, Nurses and Medical/Surgical Technicians were put to work caring for their own. In view of the large group of enemy patients, the PW Section was strengthened and the following staff placed in charge of the German medical personnel. They included Major Benjamin H. Charles, Captain Vincent Conti, First Lieutenant Frances M. Anyon, and Sergeant Arthur A. Bielenberg, who ran the operation during 8½ months, supervising the German medical staff and caring for over 2,300 PW patients. During the unit’s stay in France, the personnel was supplemented by an attached Italian Sanitary Company, a Polish Labor Company, as well as a number of German prisoners who performed multiple jobs. 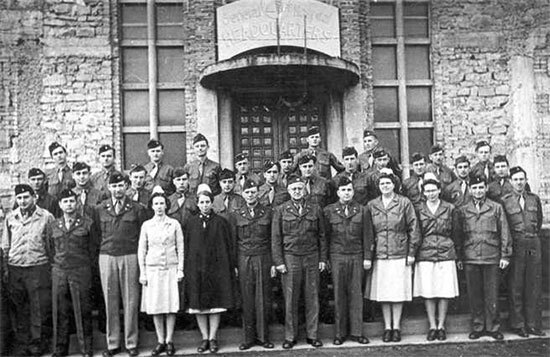 Main Headquarters staff of the 21st General Hospital, Mirecourt, France, April 12, 1945. The 21st endured perhaps its hardest test in December of 1944, during the “Battle of the Bulge.” The surprise German counter-offensive which began on December 16, breached Allied lines in Belgium and Luxembourg, threatening a new invasion of France. Evacuation plans to withdraw front line and exposed units were hastily drawn up for all medical installations in the enemy’s path. On December 26, 1944, the Hospital, although clearly identified by the required international GC symbols, was attacked by German bombers which hit close to the central heating plant, fortunately causing only minor injuries and little property damage. Following the Allied reaction and ultimate defeat of the enemy’s last big land battle, the 21st General admitted and treated a great many of the wounded from the battle. The pressure continued as the Allies now crossed the border into Germany itself. In January 1945, the 21st expanded to 4,040 beds, and treated its 50,000th patient. The facilities at Mirecourt were used to their fullest extent. Sick and wounded were cared for even in the attics of buildings. Ambulatory patients were pressed into service on the wards and in the Hospital Headquarters. Early 1945, the Hospital was operating under Sixth United States Army Group and cared for any patients serving with either the Seventh US Army under Lt. General Alexander M. Patch, or the French First Army commanded by General Jean de Lattre de Tassigny, hence the multinational number of patients. Some of the more ‘colorful’ patients admitted at the 21st General were Nisei of the 100th Infantry Battalion (composed of Japanese-American soldiers from Hawaii). February 1945 brought a marked measure of relief to the exhausted staff of the 21st. With front lines now east of the Rhine River and German resistance to Allied assaults collapsing, fewer wounded were brought daily to the hospital. The patient census dropped below 2,000 that month. There were enough talented musicians among the German PW ranks to form an orchestra, which favorably enlivened special ceremonies and dances at the Hospital and, in smaller ensembles, played in the wards and mess halls. In spring of 1945, the organization used “Villa Les Aulnelles”, at Bregnécourt, 11 miles south of Mirecourt, as a rest area for EM. The villa had been in disrepair following German occupation and was restored and turned into a comfortable and hospitable retreat for the Enlisted personnel. 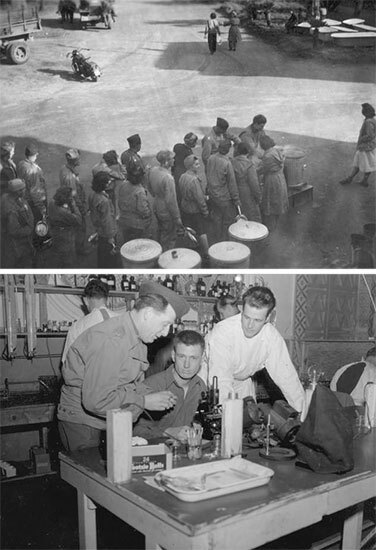 Top left: Photograph illustrating the 21st General Hospital’s Blood Bank, while at Mirecourt, France. Top right: Chow line, Mirecourt, France. Bottom left: Memorial service for the Commander-in-Chief (FDR), held April 15, 1945. Bottom right: Receiving the 60,000th patient at the 21st General Hospital, Mirecourt, France, June 19, 1945. In June 1945, the house and grounds of a beautiful Villa in Strasbourg (approximately 107 miles away –ed) were requisitioned by the Hospital for use as another rest camp for the unit’s personnel. Since Major Benjamin H. Charles oversaw the repairs and renovation of this villa, the place was christened “Château Charles” in recognition of the Officer’s efforts. The grounds included a green house, garage, flower and vegetable gardens, and could accommodate approximately 30 members of the unit at a time. The Fourth of July 1945 was duly celebrated at Mirecourt with a grand picnic. While patients, staff, and personnel gathered enjoying the event, a 40-man German PW band entertained (organized in March 1945). The numerous tables were laden with food, including fresh hard-boiled eggs, sliced cheese, whole pickles, cold potato salad, hot dogs, sliced roast beef, lettuce, mustard, and cake. One table held only candy and cigarettes. A total of 1500 cokes, 1500 beers, and 100 gallons of orange lemonade were served during the picnic. Some of the achievements accomplished by the command were quite spectacular. A general assembly hall was used for many different activities; an Officers’ mess, a chapel with an altar set up behind removable screens, a movie theater, a dance hall, and just as a main assembly or large meeting room. Moreover, a cinema building was inaugurated with a 600-seat capacity. The 21st General ran their Blood Bank, relying on donations from the command. While at Mirecourt, the Head Dietitian even began an Italian Noodle factory to prepare noodles and ravioli for the different messes. As they had done since 1942, the organization continued to print and distribute a general newsletter, the “21st General Hospital Daily Bulletin”. Following the end of the war in Europe, Victory inevitably brought a new variety of challenges to the command. Although the patient census decreased, many severely wounded remained with the Hospital for treatment. With the implementation of Redeployment and Readjustment policies, accompanied by the Point System, many Officers, Nurses, and Enlisted Men, were needed for other assignments, thus rapidly transferring out of the unit, creating staff shortages. On the other hand personnel who had reached the necessary number of points were sent to other units to return home; and consequently were replaced by low-pointers and less skilled personnel. As fluctuations continued, it became a real struggle for the CO and his depleted command to maintain hospital services despite continuous changes in the duty roster. Copy of Meritorious Service Unit Plaque document (souvenir distribution) awarded to the 21st General Hospital, September 20, 1945. 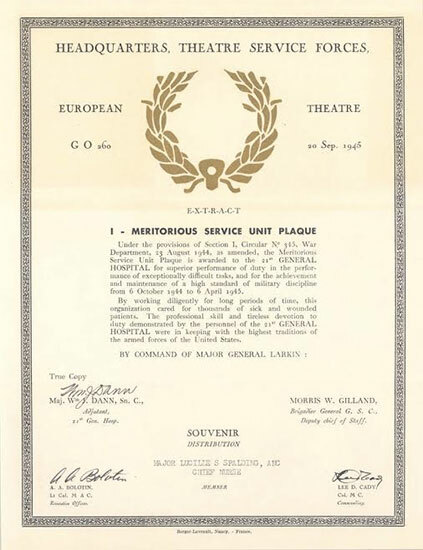 On September 20, 1945, the US Army bestowed the Meritorious Service Unit Plaque on the 21st General. The award commended the organization for its “professional skill and tireless devotion to duty demonstrated by the personnel of the 21st General Hospital that were in keeping with the highest traditions of the Armed Forces of the United States.” Meanwhile, the remaining personnel still operating at Ravenel Hospital had, by this date, (plant closed 12 September –ed) been relieved of medical duties and were packing for return to the Zone of Interior. The members of the command were transported to Marseille by way of motor convoy and the infamous “40 & 8” French railway cars, leaving Mirecourt, October 12, 1945. Following a short period of staging some 15 miles west of Marseille, Southern France (Calas Staging Area –ed), Colonel Lee D. Cady and his staff boarded the Victory ship Westminster Victory, which sailed from Marseille October 27, 1945. The ship reached Boston, Massachusetts November 7, 1945, following some rough time on the high seas. The ANC Officers apparently traveled on the West Point AP-23, leaving either in October or November 1945, with destination Newport News, Virginia. The 21st General Hospital was then taken to Camp Myles Standish, Boston, Massachusetts (Staging Area for Boston Port of Embarkation; total acreage 1,485; troop capacity 1,298 Officers & 23,100 Enlisted Men –ed), given an official welcome, and its members finally processed for discharge. Left: Colonel Charles F. Davis, Commanding Officer, 21st General Hospital, 1942-1943. Right: Colonel Lee D. Cady, Commanding Officer, 21st General Hospital, 1943-1945. Lt. Colonel George J. L. Wulff, Jr.
From L to R: Lt. 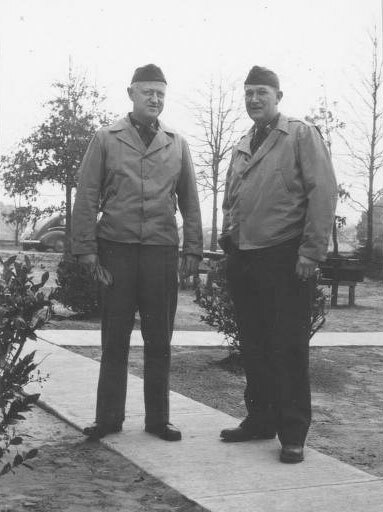 Colonel Lee D. Cady and Captain Oscar P. Hampton, Jr., Chief Orthopedic Service, Fort Benning, Georgia, 1942. Major Edward C. Burtenshaw Major Ernest P. Buxton, Jr.
Major Burchard S. Pruett, MC Major Charles M. Trammell, Jr.
Top: Officers relax in the sun at Bou Hanifia, Algeria, 1943. 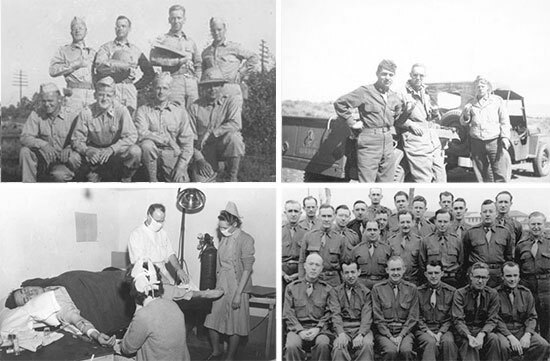 From L to R: Captain John H. Wedig, Captain Dan W. Myers, Major Lewis H. Oden, Jr., Major Sim F. Beam, 1st Lieutenant Glen P. Kallenbach, Major Ernest P. Buxton, Jr.
Bottom: Patients’ Ward, Bou Hanifia, Algeria. 2d Lieutenant Irene P. Steplyk taking a break with patients, 1943. 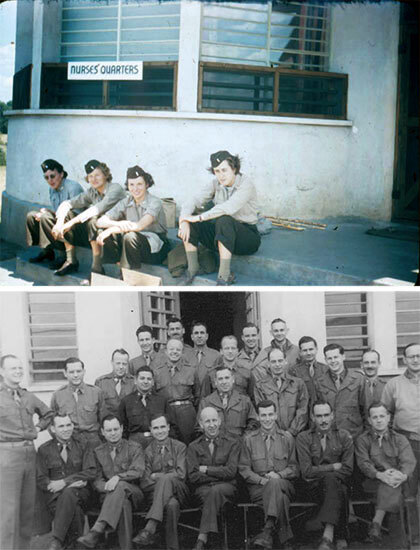 First Lieutenant Edgar H. Keys, Jr., MC First Lieutenant Theodore E. Kircher, Jr.
Top: Officers and Nurses Mess at Termini di Agnano, Naples, Italy, December 1943. Bottom: Research Laboratory, Naples, Italy. From L to R: Lt. Colonel Harry Agress, Tec 4 Thomas F. Burke, Tec 4 Kenneth F. Miles, March 1944. Top: Nurses’ quarters, Mirecourt, France, summer 1945. Bottom: Front row: Colonel John F. Patton, Chief Surgical Service (4th from left) with Officers of his department, Mirecourt, France, April 1945. 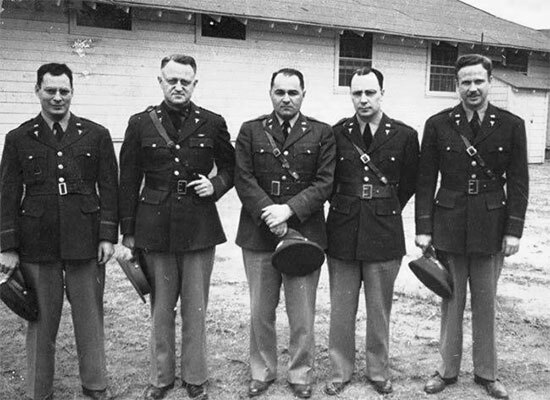 Top left: Some of the original Officers of the 21st General Hospital, while in training at Fort Benning, Georgia, January 1942. Front row, from L to R: 1st Lieutenant Andrew M. Zane, 1st Lieutenant Herbert H. Slatery, Jr., 1st Lieutenant Francis R. Crouch, unidentified Officer. Back row, from L to R: 1st Lieutenant Russell J. Crider, 1st Lieutenant Theodore E. Kircher, Jr., 1st Lieutenant David N. Kerr, 1st Lieutenant Glen P. Kallenbach. Top right: Some Officers of the 21st General Hospital while serving in Algeria, North Africa, March 1943. From L to R: Captain Louis D. Bishop, Major Benjamin H. Charles, Captain Wilson G. Brown. Bottom left: Orthopedic operation by a Surgical Officer of the 21st General Hospital, while serving in Naples, Italy, March 1944. From L to R: Captain Russel J. Crider is performing a closure of a gunshot wound over a fracture, 1st Lieutenant Eleanor D. Brinkmeyer is assisting the Surgeon, other Nurse unidentified. Bottom right: Group photograph of combined staff of the 21st and 238th General Hospitals, serving at Mirecourt, France, March 1945. The 238th General Hospital received parallel training before running its own unit. Some Officers are identified. First row, from L to R: Major Ernest P. Buxton, Jr. (1st), Lt. Colonel Sim F. Beam (4th), Major Benjamin H. Charles (5th), Major John H. Wedig (6th). Second row: from L to R: Captain Morris Zimmerman (3d), Major William H. Chapman, Jr. (4th), Major Robert W. Kelley (5th). The MRC Staff are truly indebted to Phillip Skroska, Archivist, Visual and Graphic Archives, Bernard Becker Medical Library, Washington University School of Medicine, St. Louis, Missouri, for receiving permission to use some of the images from their collections related to the history of the 21st General Hospital, and allowing them to utilize the information contained in the paper written by Paul G. Anderson, PhD, “21st General Hospital during World War II, 1939-1945” (http://beckerexhibits.wustl.edu/gh21/ww2/index.htm) for editing a concise Unit History of said medical unit for the MRC Website. Mr. Skroska’s kind assistance was very much appreciated. Further thanks are due to Fletcher Davis, grandson of Colonel Charles F. Davis, one of the previous Commanding Officers of the 21st General Hospital, who provided some extra information.